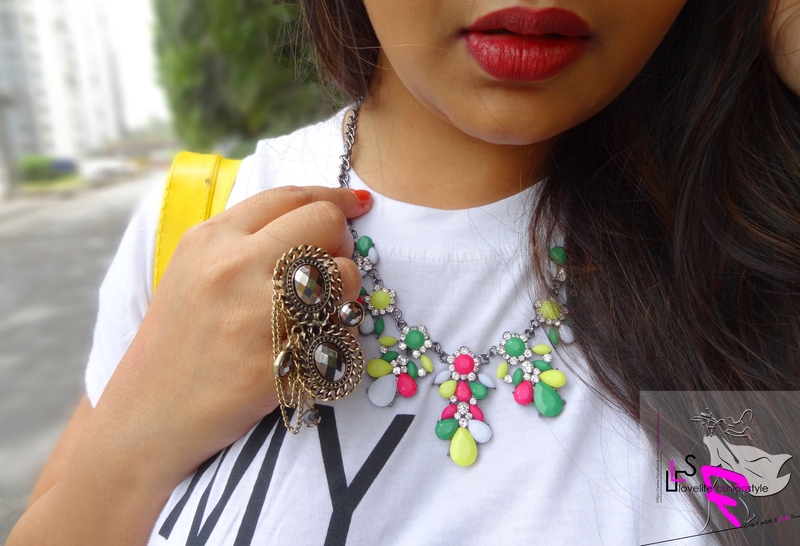 So, when Zachi sent this cool white tee across to me, I knew exactly how to style it! 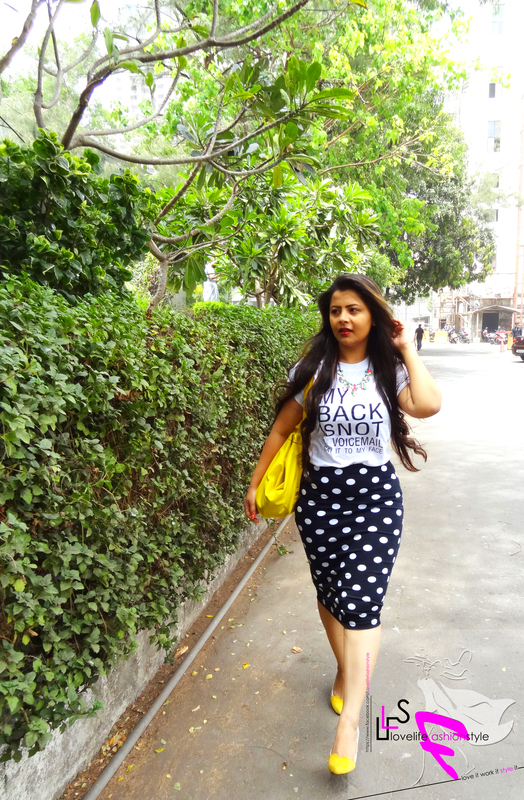 Perfect for summers, Graphic Tees are the hype right now and are literally all over the globe – be it on the runways, off-duty style or even Casual Fridays! Major reason behind them dominating the fashion scene at the moment are simply because of their versatility which can take you through from day-to-night and definitely adds a lot of edge to any outfit without having to do much and Second of all – it’s quite easy on one’s pocket, right? 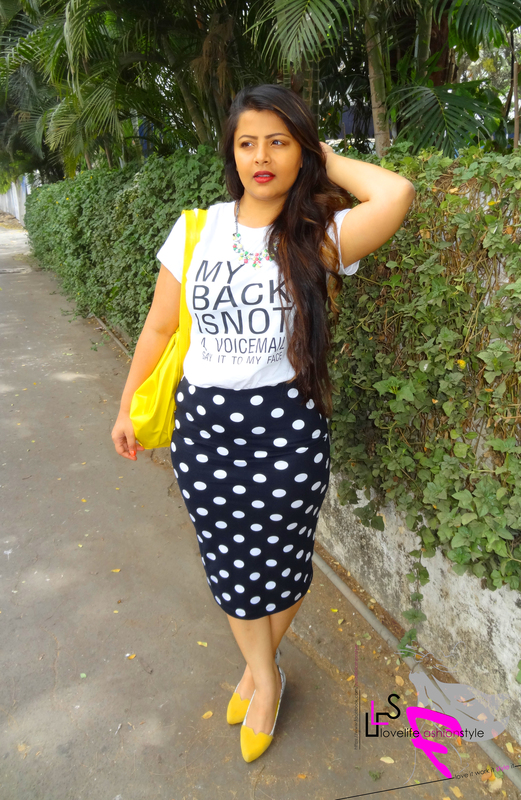 Also, one thing that I totally love about these graphic tee trend is that it instantly adds a quirk element to any outfit – which I think, totally takes your casual look to a whole new level, doesn’t it? 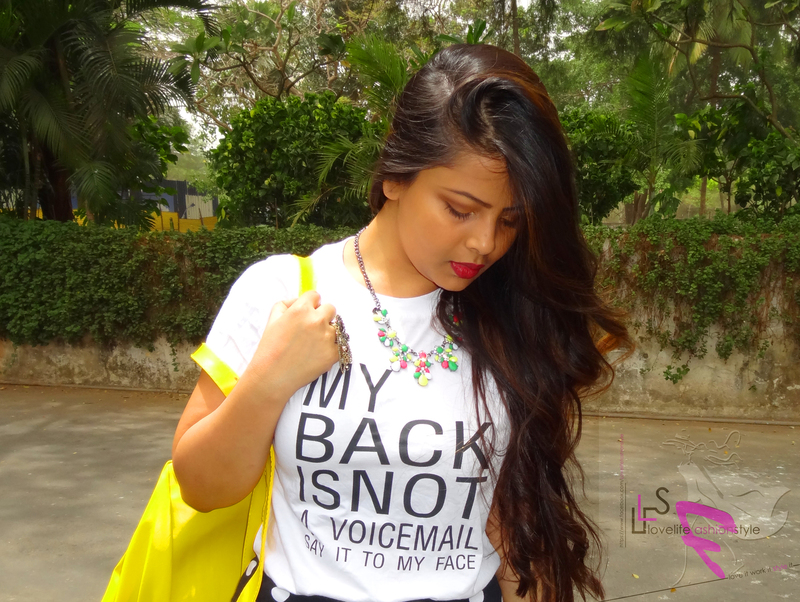 Well ya, back to this cute tee from Zachi which distinctly says “My Back is not my Voice-mail, Say it To My Face” (and which I quite liked as well :P), what I loved most about this tee is the soft material that didn’t make me look boxy (which a tee in thick material otherwise will end up doing) and helped me retain my curves. 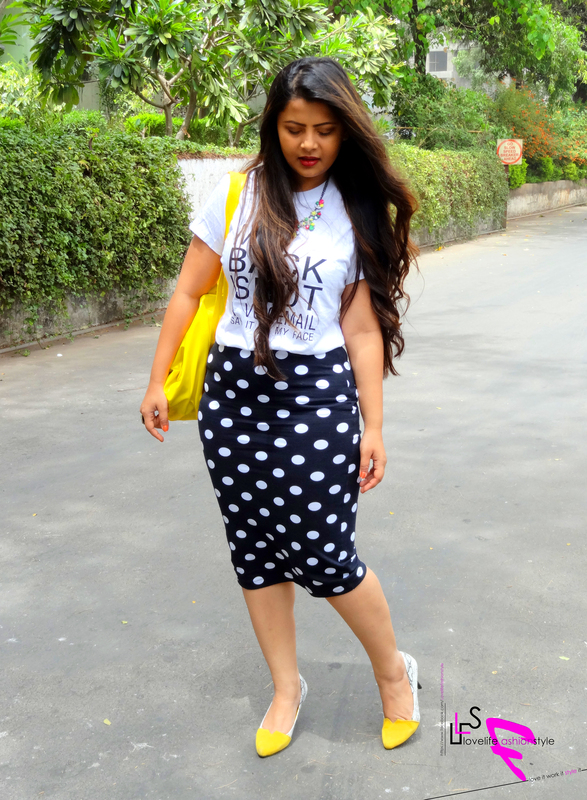 For this look, I decided to play with the fun casual element while adding a major dose of polka in the form of a pencil skirt. 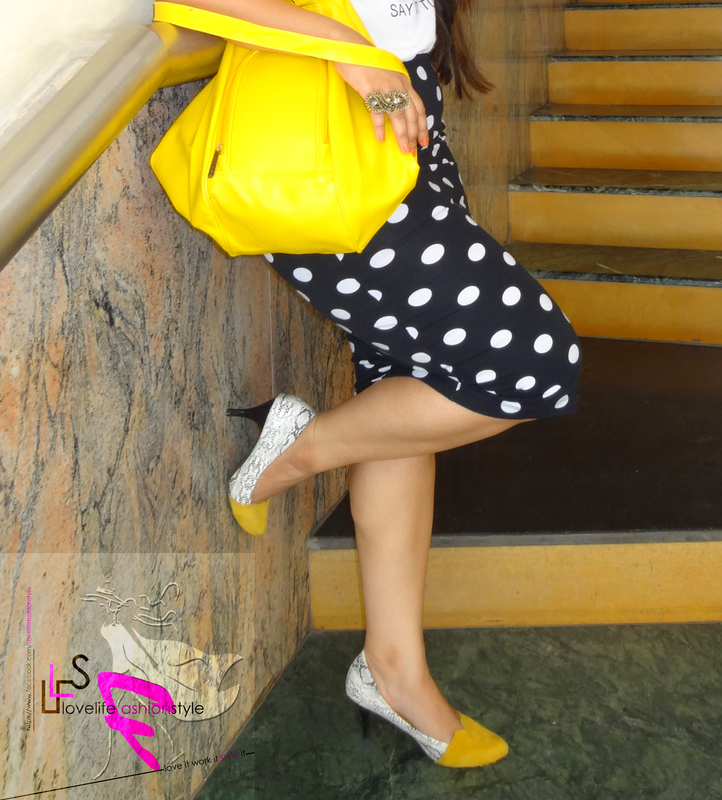 Pops of yellow here and there in the form of shoes, bag and the chic statement necklace from fashionstyle_accessories. 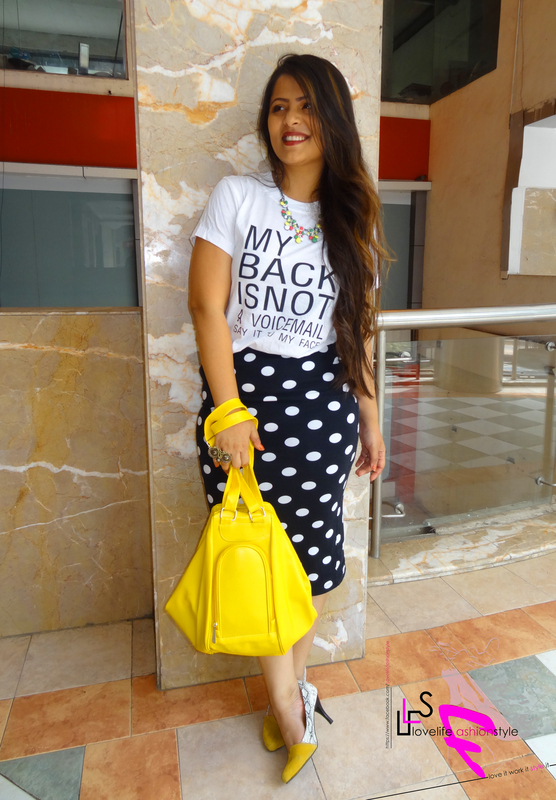 By the way, do check out Fashionstyle_accessories, as they have some real trendy statement pieces at such affordable prices all under one roof… 🙂 This is one such look where each item added some sort of element to the whole look – the polka dot skirt added fun and structure while the Graphic Tee added comfort and edge while the gorgeous accessories made sure that there’s no dearth of color in the monochrome look! Hope you guys liked the look as much as I did shooting it for you guys.